Discussions Magazine Music Blog: BECCA/Alive!! : CD available March 2nd, 2010! 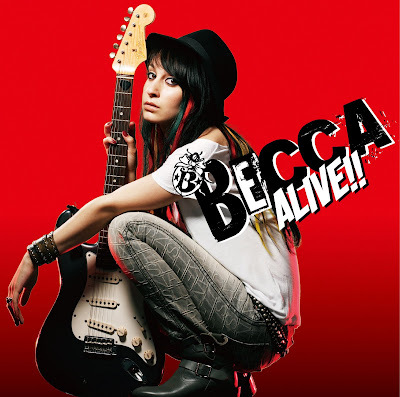 BECCA/Alive!! : CD available March 2nd, 2010! Alive!! is the 2010 release from the self-described 'Rock chick' who was singing before she learned to walk, Portland, OR native Becca's list of accomplishments include being discovered by Meredith Brooks and becoming a multi-media star in Japan, all while she was still a teenager. The 20 year old shows maturity beyond her years on songs like 'I'm Alive!' and 'Turn Up The Stereo'. Songs examining personal relationships show a young woman wise beyond her years. Becca first picked up a guitar at 10 to accompany herself, and by 14 was writing with fellow Oregonian Meredith Brooks. Brooks was looking for a young female rocker to work with and ended up co-writing and producing Becca's debut album. visit her MySpace page HERE!